They teased a reveal coming soon when they showed off the Age of Ultron Hulk figure, but Hot Toys are back this week with a look at their gigantic, wonderful take on the Hulkbuster suit. It's a big one! I'm not joking when I say that it's a big one either. Hot Toy's 1:6 figures usually clock in at around 30-35cm, but the Hulkbuster trumps them all to come in at a whopping 55cm tall (Take it away, Mister Antilles). It's not just the size that's impressive though, the detailing on the armour is exquisitely done - to the point it often looks like it's a still from a trailer rather than a giant figure - down to the fines bits of weathering or the nuts and bolts. It's completley articulated too, letting you make some pretty awesome looking poses too. Although it doesn't come with any accessories save for some alternate open-palmed gauntlets - understandable considering its huge size - but the Hulkbuster does come with a few special features. The whole suit is wired up to light up 16 different LEDs over the armour, from the arc reactor in the chest and the lights behind the eyes, as well as the lights on the knees, arm gauntlets, hands and more. Think of it almost as a giant, awesome lamp. On top of that you can actually pop open the Hulkbuster's head to reveal a bust of Tony's Iron Man XLIII suit, which is also lit up with LEDs, so it looks like he's inside there. Kind of a shame that they didn't go full crazy and include a fully articulated 1:6 Iron Man figure inside the Hulkbuster that you could remove, but that would probably make this cost exactly one hojillion dollars. 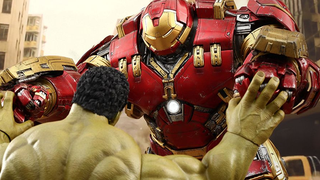 Hot Toys' Hulkbuster is due out early next year. It's not quite available for pre-order yet, but considering the size and scope of the ginormous thing, get ready for it to set you back a lot more than your usual Hot Toys figure — which, considering they're eye-watering enough at $300-ish, is going to be quite painful to see. I'll update the article when preorders and the price are live later today. Meanwhile check out plenty more pictures at the link below.